If you are looking for a cheap hotel at Doncaster airport, book with HolidayExtras.com® to save up to 40 per cent on the standard price. Our simple booking system and our award winning contact centre will make life even easier. Pre-booking a room at a Doncaster airport hotel will ensure that you get the best room for you and make maximum savings. As room availability decreases, prices tend to rise so it is always best to pre-book. It means you can also avoid the stress and expense of trying to find an airport hotel on the day. Look forward to your holiday safe in the knowledge that your journey starts or ends with a great nights stay at a HolidayExtras.com hotel. What hotels are there at Doncaster airport? 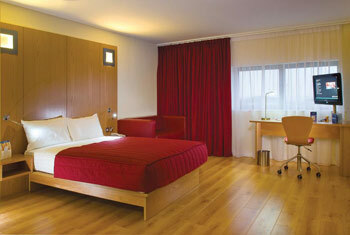 Our Doncaster airport hotel is the Ramada Encore Hotel. This 3-star hotel is located within the airport grounds and is just 400 metres away from the terminal, so you can skip the transfers and take a leisurely stroll to the terminal instead. 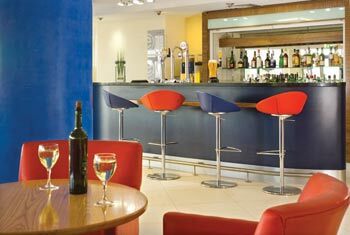 Youll be able to relax in a warm and friendly atmosphere at the Ramada Encore Doncaster Hub bar and lounge, where you can enjoy a range of snacks and drinks. Meals are served until 10pm. The Hub bar and lounge has free Wi-Fi and is open daily, so you can keep up with e-mails if you wish. Finally, start your morning with a full English breakfast and feel relaxed, refreshed and 100 per cent ready for your journey. What upgrades can I add to my booking? For only £1, our Traffic Assistant service will inform you of traffic updates via text on the day you travel. The FairFX currency card provides a safe and competitive way to carry money abroad. It is a prepaid Mastercard that works just like your debit card. The card costs £10 but, when you book with HolidayExtras.com, you will receive £10 in currency to cover that cost. Unlike most debit and credit cards, this card has no hidden costs. Your card is sent to you preloaded with your chosen currency at a competitive exchange rate.